Biography of 15th Century Flemish Painter. An important contributor to Flemish painting in the third quarter of the fifteenth century, Petrus Christus was the foremost artist in Bruges, following the death of Jan van Eyck (1390-1441), whose pupil he may have been. He was greatly influenced by Van Eyck and to a lesser extent by Roger van der Weyden (1400-1464), although the figures in his own religious art tend to lack dramatic impact, a weakness illustrated in his "Lamentation over the Dead Christ" (1450, Musees Royaux de Beaux-Arts, Brussels) which borrows heavily from van der Weyden's "Descent from the Cross" (1440, Prado, Madrid). His true metier, however, was not Biblical art but portraiture. 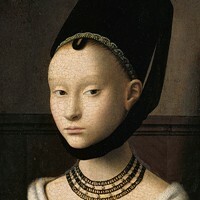 The best-known example of Christus' portrait art is undoubtedly "Portrait of a Young Girl" (c.1470, Gemaldegalerie, Berlin), while others include "Portrait of Edward Grymestone" (1446, National Gallery, London), in which he eschews the dark backgrounds of Eyck and Weyden, and places his subject in a clearly defined interior. Like several other Flemish painters of the time, Christus possessed an excellent grasp of perspective as well as a precise technique gleaned from the tradition of miniature painting used in illuminated manuscripts - see especially International Gothic Iluminations (1375-1450) - a medium thoroughly mastered by artists in Flanders and Northern France. (For more, see: French Painting 1400 onwards). For other Flemish artists active during the early era of Netherlandish Renaissance Art (1430-1580), please see: Melchior Broederlam (1350-1411), Jacquemart de Hesdin (1355-1414), Robert Campin (1375-1444), Dieric Bouts (1420-75), Hans Memling (1430-94) and Hugo van der Goes (1440-82). Few recorded details exist about the life of Petrus Christus - in particular, whether he visited Italy or to what extent he was aware of the Florentine Renaissance (1400-90). Indeed his artistic importance as one of Flanders' great Old Masters was not understood until the scholarly efforts of art historian Gustav Friedrich Waagen (1794-1868) and curator Johann David Passavant (1787-1861). He is mentioned in Bruges from 1444 onwards. In 1454 he made three copies of the "Vierge Miraculeuse" of Cambrai, and in 1462 joined the Confraternity of the Dry Tree with his wife. In 1463 and 1467 he decorated banners for the processions of the Confraternity of the Holy Blood and in 1472 acted as an examiner of paintings. The sources of his style, too, are as yet little understood, although it was at one time thought that it must derive from a close association with Jan van Eyck, possibly as overseer in his studio, and that Christus became independent only after the death of his master in 1441, completing his unfinished works, (such as "The Rothschild Madonna", Frick Collection, New York). NOTE: 15th Century Flemish artists were pioneers of oil painting and were among the first to move from small-scale illuminations to large-scale panel paintings, notably altarpieces in the form of triptychs (Portinari Altarpiece 1479) and polyptychs (Ghent Altarpiece 1432). Christus's contribution to Northern Renaissance art is marked by several dated paintings, which allow his development to be followed over a period of time. "The Portrait of a Carthusian Monk" (1446, Metropolitan Museum of Art, NY) is remarkable for its trompe l'oeil illusionism, such as the fly on the parapet which, in the manner of Van Eyck, encloses the composition in the foreground. "The Portrait of Edward Grymestone" (1446) demonstrates a growing taste for clear lighting and a predilection for a simple, almost geometric setting. In 1449 came the "Virgin Nursing the Child" (Koninklijk Museum voor Schone Kunsten, Antwerp), as well as the so-called "St. Eligius in His Shop" (Metropolitan Museum of Art, Ny). Here, on the pretext of depicting the patron saint of jewellers, Christus painted a true genre scene of a young couple buying a ring in the saint's shop. Although the reflections of light remind one of Van Eyck, the simple volumes and stiff movements are an essential part of Christus's style. These occur again in the "Nativity" in the National Gallery of Art, Washington DC, which also takes from Van der Weyden the theme of the 'diaphragm' arch (an architectural motif that makes an opening on to the scene represented), as well as in the "Deposition" (Musees Royaux de Beaux-Arts, Brussels) and, less obviously, in the smaller version of the same work in the Metropolitan Museum. These works, in fact, reveal Christus's failure to grasp the essence of Van der Weyden's art: he took certain gestures from him, like that of the weeping Magdelene, but the emotional spirit and elegance have completely disappeared, and the sense of pathos and loss is replaced by a solemn stiffness. Christus's greatest masterpiece is "The Portrait of a Young Woman" (c.1470, Gemaldegalerie, Berlin). The lovely oval face with its slightly wary eyes, treated in simple volumes, has a particularly mysterious character. Painters & sculptors from Flanders, Holland, Germany and England. Famous Netherlandish miniaturists noted for their "Les Tres Riches Heures". Outstanding works by Italian and Northern Renaissance portrait artists. Famous for Portrait of Charles VII (1445) and the Melun Diptych (1452). Famous for The Avignon Pieta (1454-6).  For analysis of important Flemish pictures, see: Famous Paintings Analyzed.  For more biographies of Flemish painters, see: Homepage.